An unexecuted design, awarded Second Place after an architectural competition to design a complex of museum and library around Leinster House (then part of the Royal Dublin Society). 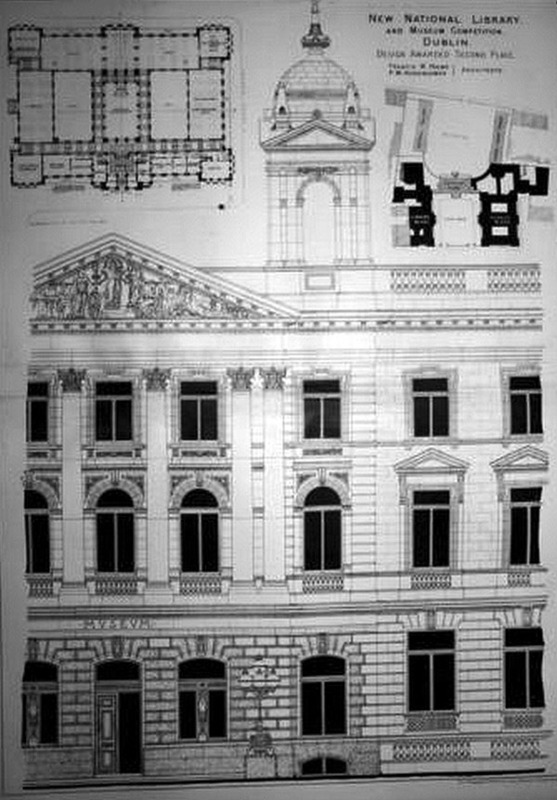 Illustrations showing Kildare Street Elevation and Quadrangle Front of Museum; the other, showing details of the facade and ground plans, by Francis W. Holme and F. W. Hornblower, architects. Published in The Building News, June 3 1883. The results of the original architecture competition were scrapped after it was found out that all the entrants were “minor” English architects including E.W. Godwin. Eventually Thomas Newenham Deane was selected as architect.